White coats sparkle without bleaching when shampooed with this extraordinary formula that has been developed for white and other light-colored coats. 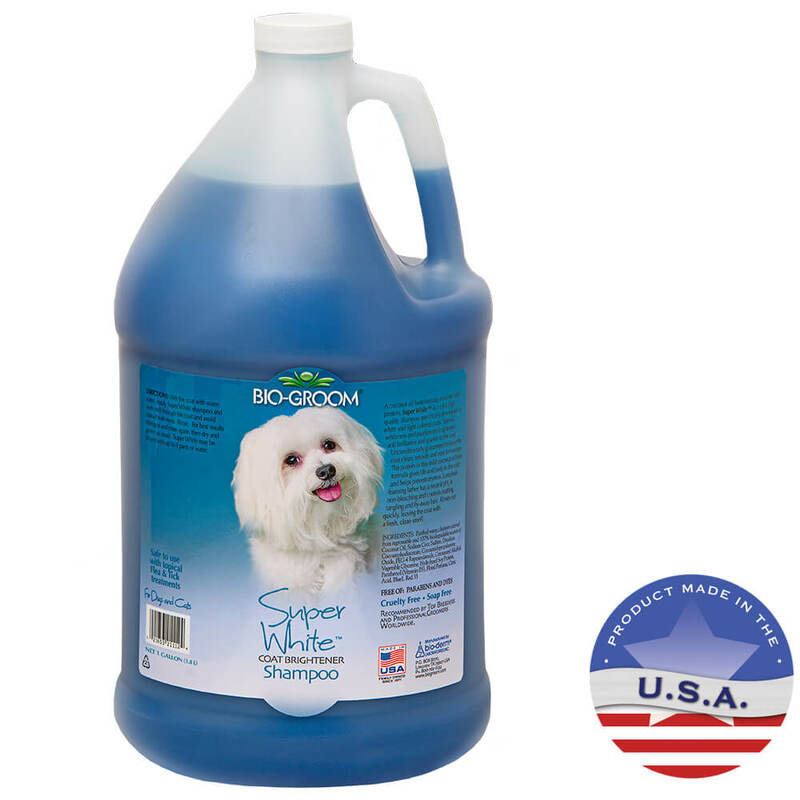 Fortified with protein, Bio Groom Super White Shampoo cleans your pet's fur thoroughly while adding life and body to the coat. Super White™ controls matting, tangling, and fly-away hair. Its rich lather rinses out easily, leaving the hair smooth, manageable, shiny, and with a fresh clean smell. It is rich and foamy with neutral pH. Purified water, cleanser-derived from regrowable and 100% biodegradable source of coconut oil, Sodium Coco Sulfate, Disodium cocoamphodiacetate, Cocomidopropylamine Oxide, PEG-4 Rapeseedamide, Cetostearyl Alcohol, Vegetable Glycerin, Hydrolyzed Soy Protein, Panthenol(Vitamin B5), Floral Perfume, Citric acid, Blue 1, Red 33. Wet the coat with warm water. Apply shampoo and work well through the coat. Rinse. For best results shampoo and rinse again, then dry and groom as usual. Super White may be diluted with 4 parts of water.